Have you been in one of those situations where you are adamant that you don’t want to and won’t do something only to end up not only doing it, but loving it, too? You just refuse to listen to any logic, refute whatever arguments the other party might have and, obstinately, dig your feet in, clearly stating that no, you won’t go there, you won’t do that and, yes, you are sure you will hate it. Only to eat a super large portion of humble pie afterwards. Basically this was me down to a tee only a few days ago. You see, I had been planning our day in Verona for a couple of weeks. I knew exactly what I wanted us to see and do. 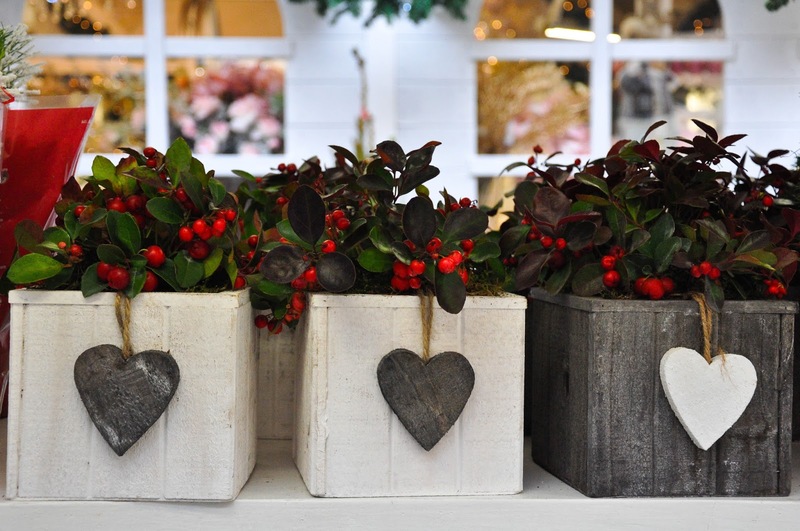 We hadn’t been back to the city of Romeo and Juliet since a very rainy 14th February and I was really looking forward to spending a lovely Christmas cheer infused day there. The German Christmas market was top of my list, followed by a visit to the International Exhibition of the Nativity Scenes for our little daughter to see all the different figurines and layouts which had come to Verona from all over the world. Tara-tah-ruh! Then and there in our little red car I lost it. Or, I lost it as much as you can do it in the presence of a small toddler who must at all times see only the most civilised face of her mum. In a nutshell this is what I said: ‘We won’t have time to do it all. And I hate modernists! I don’t understand modernists! And you want me to go to an exhibition looking at paintings of squares and lines which mean nothing?! I won’t do it!’. You see, I am an old-masters-girl through and through. I adore paintings where you can actually tell an elbow from a face and, yes, I really can’t quite grasp that early 20th century’s impetus to deconstruct the world and reduce it to a smudge on a large canvass. ‘The exhibition is actually about post-impressionism’, my husband quietly said. I didn’t budge. So, my husband, the lovely, kind and caring person that he is, declared defeat. We had a wonderful time in Verona. 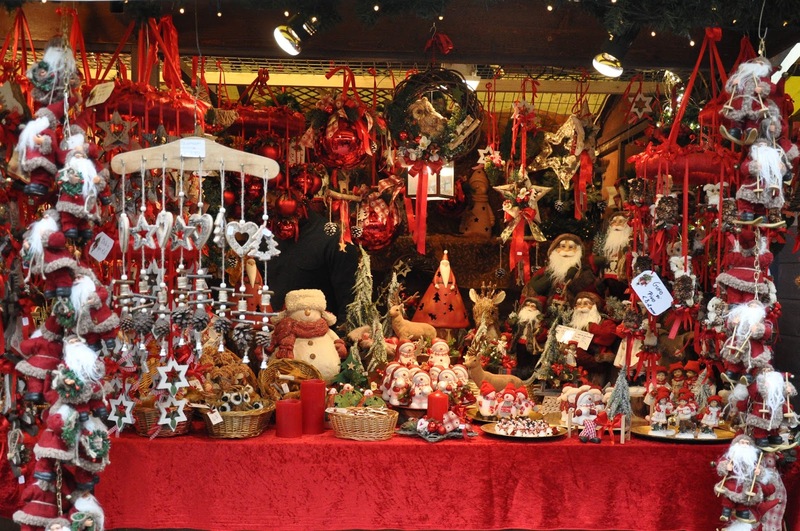 The German Christmas market was smashing and we shopped for Christmas baubles and decorations, marveled at the handcrafted slippers from South Tyrol and feasted on pretzels, chocolates and other traditional Christmas delights. 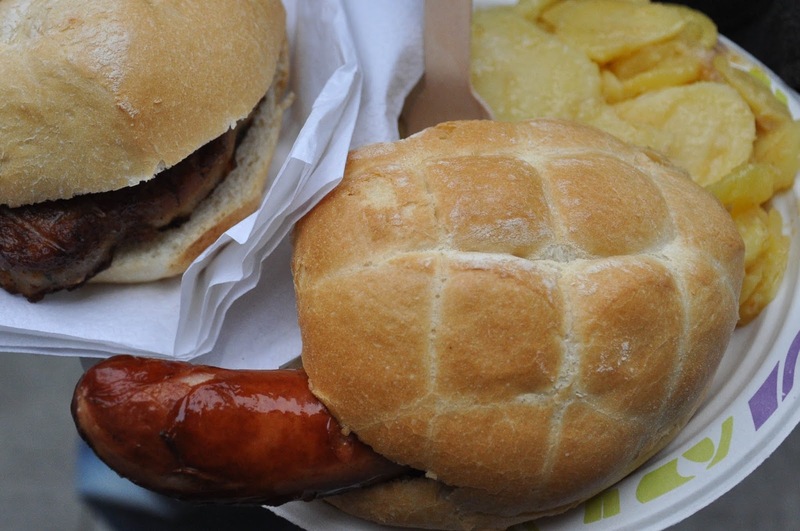 There is a lot to be said about eating a hearty lunch of German sausage with a generous helping of potatoes and warm sauerkraut on a medieval square and in the shadow of a Dante’s statue. Full of Christmas cheer we headed back to the mighty Arena di Verona (did you know that this Roman amphitheatre is older than the Colosseum in Rome?!) where the International Exhibition of the Nativity Scenes was taking place. We followed the busy streets of Verona, full with people and festively decorated shops. Just then, I spotted a large poster advertising the very exhibition I had so vehemently refused to see. 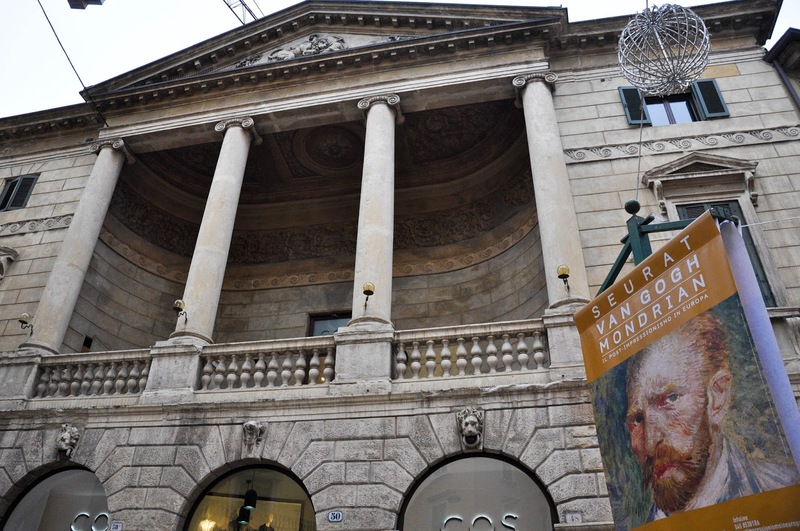 It simply said: ‘Seurat, Van Gogh, Mondrian – The Post-Impressionism in Europe’. I felt a twinge of guilt! ‘Would you still like us to go and see it? !’, I asked my husband, feeling really, really bad about my earlier outburst. Yes, sometimes, I am quite prone to spontaneous emotional fits, but I hate it, I totally hate it when I only end up making people I love feel bad. ‘No, don’t worry!, he said. We won’t have time anyway. Let’s stick to plan and see the Nativity scenes.’ But just as we reached the Arena, warm and comfortable in her buggy, our little daughter fell asleep. As the visit to the International Exhibition of the Nativity Scenes had been conceived primarily for her, all of a sudden going there lost its appeal. As luck would have it, I spotted large posters adorning the huge Palazzo della Gran Guardia just across the vast Piazza Bra. We decided to have a look. Believe it or not, this was the very place where the ‘Seurat, Van Gogh, Mondrian – Post-Impressionism in Europe’ exhibition was being held. I grabbed the opportunity to alleviate my guilty conscience with two hands. ‘Come on, darling,’ I said. ‘Let’s go see it!’. And, yes, I loved it. It was the best exhibition I had seen in a very very long time. The paintings were absolutely divine and the whole set-up was ingenious, too. The most important thing for me though was that I finally understood why artists all of a sudden started to veer away from traditional painting techniques, why they eventually abandoned the established cannon of clear and faithful reproduction of our physical world and instead focused more and more on deconstructing reality down to its very basic yet fundamental outlines as in the case of Mondrian. This apparent simplification was not due to a sudden impulse or a creative laziness, as I had always thought. It was a gradual evolution helped along by scientific knowledge about the colour spectrum and practical advances in the production of paints in a much bigger variety of colours than before. Previously painters would only have at their disposal a very limited number of paints, which they would mix and blend on their palettes and then apply the obtained shade on the canvass. The post-impressionists all of a sudden had these brand new colours and hues, often mixed and ground to their very specific requirements, which they started to layer on the canvass as they were without prior mixing and blending. The painters of that period used their brushes to build the painting – the houses, the people, the scenes of daily life – dot by dot and smudge by smudge. They would overimpose points and dots and spots and specks and stains and splashes of different colours one on top of the other so that the actual mixing of the final colour would be produced in the eye of the viewer rather than on the palette of the painter himself. Indeed, the closer you are to the painting, the clearer you see its texture and the deconstructed reality of it. The farther you step back from it, the more cohesive the painting becomes. For me this made the paintings extremely interesting to look at and several times I would change the angle and the distance from which I would look at a painting in order to experience it in different ways. Once the deconstruction of colour had began, sooner this led to a deconstruction of reality, too and I loved a saying by Mondrian pinned to the wall right at the end of the exhibition, which basically said (quoting from memory) that a real artist is more preoccupied with the harmony of lines rather than the actual obbjects he is painting. And for the first time in my life, I was able to understand this. I remembered how preoccupied I am with alignment when I am taking photos and how I often compose them by cropping out things which are amazing per se, but they don’t marry well into the composition of straight and/or leading lines I have in mind. So, yes, for the first time in my life, I was able to look at a Mondrian’s painting and see beyond the simple grid of black lines and the blue, yellow and red squares in it. Apart from Mondrian, I loved seeing the three paintings by Seurat with which the exhibition starts and the several pieces on display by Van Gogh. I also loved discovering painters like Paul Signac, Henri Edmond Cross, and, especially, Theo Van Rysselberghe. Another very interesting aspect of the exhibition was the space dedicated to colours and the science attached to them. I loved the huge wall illustrating the number of colours available to painters through the centuries. I was able to visually appreciate the restricted options the old masters had at their disposal and then how, with the evolution of science, new shades were made available to artists. I appreciated too the logical way in which the exhibition had been set up. As you explore it you follow a set path through the different rooms. Sometimes it feels like you are going round in circles or like you are going back to where you started only to realise a split second later that no, you have progressed one stage up and your understanding of the Pointillism and the Post-Impressionism has expanded beyond any reserves you may have had, just like me, about them. The rooms were also very quiet with people moving from painting to painting in an elegant and tranquil dance. The soft light emphasised the beauty of the works on the walls. It was so peaceful that our little toddler slept uninterruptedly all the way through, which also gave us a chance to explore the exhibition in depth. If you go with kids, there is a special activity developed for them, so that they will be kept entertained whilst exploring the exhibition with you. 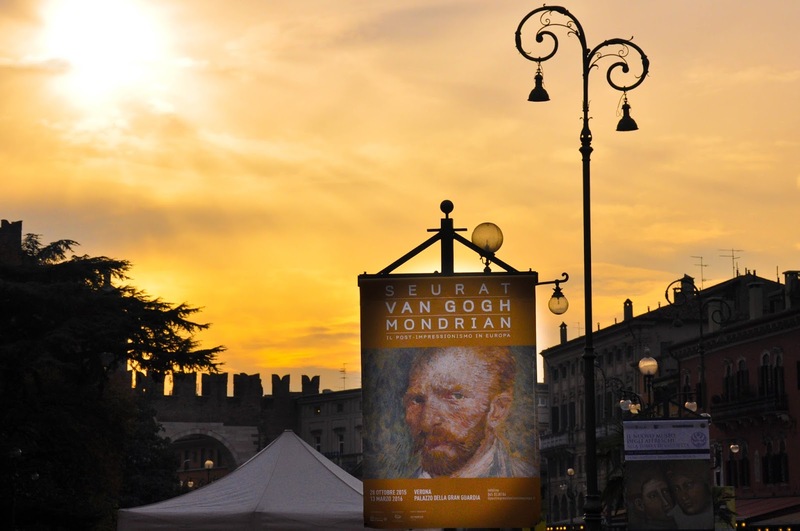 If you find yourself in Verona from now until 13th March 2016 and a friend or a loved one suggests that you go and visit ‘Seurat, Van Gogh, Mondrian – The Post Impressionism in Europe’, just say ‘Yes!’ straight away. I am sure you will love it! After all, I (in spite of my complete previous unappreciation for this particular school of art) totally did.